2018 was a productive year! Accomplishments include uploading a free online legal resource for incarcerated people returning to the community; continuing our family law clinic at the Hawai’i women’s prison; starting a school project; and providing our reentry circles, which I went to Budapest, Hungary, Wellington, New Zealand, and Santa Cruz, California to talk about this year. A terribly sad case also took me to Seward, Alaska to meet Terria Walters Vandenhuerk. Terria’s 23-year-old son Matthew was murdered in a drug-related robbery. Instead of seeking revenge and retribution, Terria wanted Joshua who pled guilty to murdering Matthew, to be restored and rehabilitated. She met with Joshua and wanted him to have a reentry circle. Today we are helping her provide the circles in Alaska. The meeting between Terri and Joshua was filmed for a Van Jones CNN restorative justice series airing in 2019. More about our work is included in this annual report. I extend a GIANT heartfelt mahalo to our highly committed board of directors, everyone who donates pro bono services, and all other supporters. As one board member recently said “we are small but mighty!” But our happy successes too in 2018 should not overshadow big disappointments including the state of Hawai’i’s adamant plans to build new prisons on all islands despite our strong advocacy against it. Sometimes our goals seem insurmountable, but the following poem, written by Totie an imprisoned woman whom we work with and who wanted us to share it, helps inspire us through the difficulties. We hope her poem inspires you too through hardships, and that we all find the energy and strength to keep working to improve things. Mahalo for your support, and wishing you more successes than defeats in 2019. We all learn that falling down is a part of life, But it’s the getting back up that’s the living – Only then is it a lovely day. We learn the subtle difference between freeing your mind and chaining your soul We begin to see that gray clouds are not a contract and blue skies aren’t promises That even sunshine burns if you get too much. -And when you understand that then it’s gonna be a lovely day. We don’t need anyone to validate us and make us feel whole, we got us! I said…We Got Us! -And when you realize that, then it’s gonna be a lovely day. When we begin to accept our defeats, defaults and dealings with our heads up high and our eyes ahead (only) then will you understand that strength from within is more powerful than any arsenal. We learn to endure, persevere and land with our feet flat on the ground. -And when that happens, then it’s a lovely day. We are strong and beautiful, empowered and worthy Stand tall and stand proud -Cuz it’s a lovely day. We’ll learn and grow and learn some more And with every good-bye and every tear we cry We all learn the grace of being free -And that, my friends…Is a lovely Day! 4. Continued providing and studying Honolulu federal court and probation reentry circles: we provided five federal court clients and their loved ones reentry circles. 5. Continued WCCC reentry circles: provided three imprisoned women and their loved ones at the women’s prison with reentry planning circles. 6. Provided Solution-Focused Mediation & Restorative Facilitation Course for the second time for imprisoned women at WCCC. 7. Completed and published article about how teen court is not a restorative practice: https://papers.ssrn.com/sol3/papers.cfm?abstract_id=3294303 Lorenn Walker, Keyria Rodgers, and Mark Umbriet co-authored it. The five goals not achieved or that were only partly achieved included our biggest disappointment is the state of Hawai’i’s plans for new jail and prison construction. We advocated against building new jails and prisons in the state, but Hawai’i continues moving forward to build new jails and prisons on all major islands. 1. Launched online legal resource for incarcerated people: the Hawai’i reentry resources & legal guide http://hawaiifriends.org/download/hawaii-reentry-legal-resource-guide/ modeled after Root & Rebound’s California guidebook went online in Spring 2018. We are deeply indebted to Root & Rebound for its generous help with our preparation of the guidebook that took over two years to complete. Eight hard copies of the 332-page guidebook were tabbed, put into binders, and provided to the Hawai’i state department of public safety, which administers prisons and jails. The copies are for the 8 prison/jail law libraries including the private prison in Arizona and the Federal Detention Center in Honolulu that the state rents prison space from. In addition to the Root & Rebound’s help, this major project was accomplished by the pro bono efforts of many others in California and in Hawai‘i. Hawai’i State Bar Foundation (HSBF) and the Hawai’i Women’s Fund (HWF) supplied financial assistance too. 2. RJ & solution-focused school pilot: An RJ after school club and solution-focused classroom coaching support was provided for fifth graders at Kalihi school. We piloted a six-week course at Kalihi Elementary on RJ using curriculum from California. Once a week for 6 weeks we met 1.5 hours with the fifth graders mostly in circles learning about RJ. We also provided a 5th grade classroom with observing, coaching, and noting the positive strengths of students and the teacher for about 45 minutes, e.g., Kimo pulled the chair out for Melody, the teacher asked a student if she could help him, Roger used a tissue to cover his face when he sneezed not spreading germs, etc. After observing and writing down the good things that happened during our observation, we read the list of positive behaviors we noticed to the classroom. On the last day after reading what we noticed to the class we gave each child and the teacher a blank journal and a pen. This pilot is based on the Working on What Works classroom model that is an alternative to traditional educational strategies that mainly tell and lecture to people what they should to for good classroom management. The late Insoo Kim Berg helped develop WOWW. 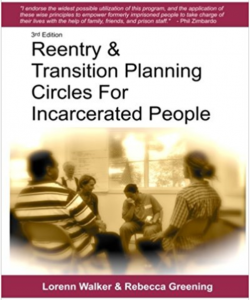 (Insoo helped us also develop our reentry planning circle process) http://www.moray.gov.uk/downloads/file78365.pdf. 3. Family law clinic at women’s prison (WCCC): 138 legal consultations were provided along with making numerous court filings, and providing other legal services through the 18 law clinics (4 -5 hours per clinic) that were held for imprisoned women and several women on parole at a furlough program in Honolulu. The project was supervised by Dawn Slaten, Esq., and funded by Hawai‘i State Bar Foundation (HSBF) and the Hawai‘i Woman’s Fund (HWF). We are grateful for all the pro bono services and financial help in providing this vital program. 4. 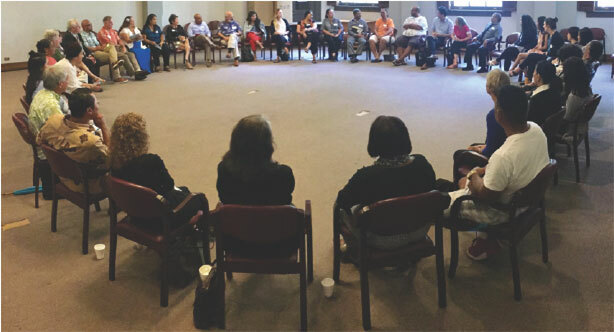 Reentry planning circles for Honolulu federal court and probation clients: we collaborated with the federal court and its pretrial services office on this project that expanded in 2018 to probationers in addition to federally incarcerated individuals. In 2018 we provided five federal court clients and their loved ones reentry circles during the year. Dozens of family members attended two of the circles, while one circle for a person from the continent had six or seven loved ones participating by Face Time. A total of nine circles have been provided for the 12 circle project that ends in August 2019. 5. WCCC reentry circles: provided three imprisoned women and their loved ones at the women’s prison with reentry planning circles. 6. Solution-Focused Mediation & Restorative Facilitation Course fall 2017 & spring 2018 and assisted imprisoned peer educators to provide conflict management workshops to other imprisoned women: second time providing this course for imprisoned women at WCCC. This is a skill intensive course that five women graduated from as peer educators in spring 2018. In the 2018 spring the peer educators provided a workshop for other imprisoned women and in the fall, three of them provided two more conflict management workshops for other imprisoned women. Over 40 women in the prison participated in the workshops provided by these effective and skilled peer educators. We participated in the workshops as observers and participants only, and not as leaders. The five peer educators who completed the course also suggested that they write an orientation guidebook mainly for women newly admitted at WCCC with information on “how to survive prison successfully.” We edited and shepherded the draft through the prison administration for its final approval and distribution. We made copies of it and distributed it to women who attended the workshops that the graduates provided. The booklet is a useful resource and one that prison staff had also wanted to prepare themselves, but did not have the time because of other priorities. We had planned but were unable to provide our third mediator and facilitator training beginning in fall 2018. Unfortunately, our wonderful and deeply appreciated prison liaison was unavailable to assist due to medical leave. He could not recruit new course students in time for the course to begin in early fall. Instead, we met with three available graduates/peer educations from the spring semester for six times in the fall (includes the two workshops we attended). Before the two workshops, they provided we met with them four times to help them in developing their workshop agenda and getting resources they wanted, e.g. to give out pens, paper, stamped envelopes, folders and books for the women who attended the workshops. With the peer educators suggestions for titles and our knowledge too, we were able to purchase and distribute 79 inspiring books mostly memoirs, which is a vital resource for imprisoned people. The books were distributed to the women attending the workshops and also the spring training for peer educators. The women who took the workshop from the general population also gained orientation of our 2019 mediation and facilitation course and many said they wanted to take the course and become peer educators too in the spring 2019 course. 7. Teen court paper published: What Is Restorative About Teen Court? Internet Journal of Restorative Justice, Special Issue Restorative Justice and Complex Crimes, Coauthors are Lorenn Walker, Keyria Rodgers, and Mark Umbriet (more about the paper below). 1. 10th Annual Parolee Completion Celebration: was held October 9, 2018 in the Hawai’i Supreme Court that incarcerated people in the 1800s helped build. Lovely Hawaiian music by Rose Kurita from Kaua’i and her son Norm Yamaoka, who have played at the event all ten times, was enjoyed with pupu and drinks in the beautiful courthouse rotunda. Later, upstairs in the courthouse, about 70 people including parolees who were discharged from parole in 2018 along with their loved ones, lawyers, judges, parole board members, a Honolulu Police Commissioner, and many others sat side by side in giant circles in the courtroom area. Hawai’i’s beloved Aaron Mahi former conductor of the Royal Hawaiian Band for almost 25 years, and Honolulu Symphony Orchestra for about ten years, opened the talking circle with a moving Hawaiian chant. After the below received awards for their special contributions to helping people successfully discharge from parole, each person in the circle was invited to speak briefly. As always it was an inspiring and moving event. Many board members assist with this annual event. Leah Castro – Restorative Justice Community Reentry Award: Leah whose nickname is Cash has been out of prison since April 2018. She grew up in Aiea and through her hard work, and motivated by her tremendous love of her son, she overcame complex and serious childhood difficulties. She is a single parent who has created a healthy and safe home for her son. She also owns and manages HI Protection Auto Detailing on Kawaiahao Street in Kaka‘ako. Cash is a role model for those involved with the criminal justice system, and for all of us to find hope and to use our gift to address our struggles and hardships. Jackie Young, Ph.D., – Restorative Justice Community Support Award: Jackie has a long history of service for our community and is a zealous civil rights advocate. Her past roles are far too many to list, but a sampling includes Chairperson of the Hawai’i State Judicial Selection Commission, former director of the American Cancer Society for the Pacific, Hawai’i state legislator, and member of the Hawai’i US Civil Rights Advisory Committee. Jackie is a dedicated advocate for violence prevention and is a long time supporter of forgiveness. Bruce Keaulani – Restorative Justice Community Support Award: Bruce is affectionately known as Uncle Bruce. He is a koruna and spiritual advisor who wears many hats, including martial arts master, healer, and ho’oponopono practitioner. He loves all people but has a special place in his heart for youth. He’s especially helped incarcerated juveniles learn to live peacefully and he’s helped many women as they transition from prison. Uncle Bruce embodies Aloha through his humble life of service to the most vulnerable in our community. Carrie Ann Shirota, Esq. , – Restorative Justice Legal Innovations Award: Carrie Ann is from Maui and a strong advocate for social justice. She is an attorney for the Hawai‘i Civil Rights Commission and a Soros Fellow who focused on prison reform. She founded the Hawai’i Justice Coalition, which focuses on prison reform and making safer communities at less expense. Carrie Ann believes that Hawaiian cultural education is a positive alternative to imprisonment, and on Maui she helped many with this assistance. William Maemori – Judicial Innovation Award: William is the Family Court’s Juvenile Probation Administrator. He played a major role in implementing juvenile justice reforms to reduce the number of incarcerated adolescents. He focuses on services that support the youth’s strengths and protective factors, including family attachment so children stay out of lockup. His work has been a tremendous help in reducing the Hawai’i Youth Correctional Facility population. Shawn Manini – Russ Takaki Restorative Justice Award: Shawn is the Reentry Affairs Coordinator at the Honolulu Federal Detention Center. He has been instrumental in developing valuable community relationships, implementing programs, and bringing resources to the FDC. Shawn’s work helps ensure the successful return of defendants to their families and communities. He is deeply valued by his fellow workers, by people imprisoned at FDC and their loved ones for his kind and gracious attitude. Adrienne Boxer – Russ Takaki Restorative Justice Award: Adrienne is a Hawai’i State Parole Officer recognized as a respected asset and resource to her department, especially because of her positive willingness to take on new challenges. She is a hard worker, dedicated, and committed to excellence. She serves as a role model for other Hawai’i State Parole Officers for her good work and for the concern she shows for people on parole. 2. Presentations provided in Budapest, Hungary; Wellington, New Zealand; and Santa Cruz, California and Hawai’i on our reentry circle model by the executive director. The ED was invited and her expenses were paid to attend conferences to present on our reentry circle process including our research on the process. 3. Replication assistance on reentry circles: in total we have had 14 academic papers and one book that we coauthored or were sole authors of on the reentry circles published. The circles are being replicated other places including France, Hungary, Brazil, Washington DC, and Pennsylvania. We assisted and mentors French and Hungarian pilot projects providing the reentry circles – in France the circles are being provided to people convicted of murder and in Hungary the circles are being provided to incarcerated juveniles. We met Terria Walters Vandenhuerk in Alaska whose young adult son was murdered. Our ED facilitated a victim offender dialogue/circle or her and the man convicted of the murder in which both of their families provided information ahead of time that was presented during the circle (we are researching some of the results of this shuttled information for a paper in 2019). Terria wanted rehabilitation for the man in prison for life, which resulted in his receiving the first reentry circle at Alaska’s maximum security prison. The circle, that four people participated in, was filmed by CNN for a Van Jones restorative justice program to air in 2019. Following the circle provided in Alaska in October, Terria came to O’ahu for seven days of an intensive hands-on learning program about the reentry circles that she is working to provide in Alaska. We are mentoring her and helping her in her plans to provide the reentry circles in Alaska. 4. Two academic papers & one book review published: • Walker, Rodgers & Umbreit, 2018. What’s Restorative About Teen Court? Internet Journal of Restorative Justice, The paper was co-authored by: Keyria Rodgers who had run a teen court program in Illinois and while studying RJ and criminology realized teen court is not RJ as some describe it (including herself in a prior paper that she co-authored; Mark Umbreit who is a well known RJ researcher and practitioner; and HFRJ’s ED. • Walker, L. & Davidson, J., 2018. Restorative justice reentry planning for the imprisoned: An evidence-based approach to recidivism reduction, In Gavrielides, T., (Ed.) The Routledge International Handbook of Restorative Justice (2018). The Routledge International: London https://www.routledge.com/Routledge-International-Handbook-of-Restorative-Justice/Gavrielides/p/book/9781472480705. This paper describes the independent evaluation that Janet Davidson, Ph.D., provided on our reentry circles. It was a good study that eliminated self-selection bias problems because we used a control group of about 50 who applied for circles but did not get one mainly because they left prison before we could provide them with a circle. Their repeat crime rate was significantly higher for the control group than the rate for the people in the experiment group who also applied for circles but received them. • Book Review for International Journal of Offender Therapy and Comparative Criminology June, 2018: Jacked Up and Unjust: Pacific Islander Teens Confront Violent Legacies, by Katherine Irwin & Karen Umemoto. The paper describes this excellent book that describes an almost decade long study of violence and resiliency too of Pacific Islander youth in Hawai’i. ED was asked to write the book review for a law school on the East Coast but due to misunderstandings, it ended up being published in the above journal. 5. HFRJ interns and services for students: Kimberly Ulu Ka’ahanui is our 2018-2019 University of Hawai‘i intern from Myron Thompson School of Social Work—Ulu is working on her MSW and a another excellent intern from the UH social work program. She helps us with about 20 hours of work a week. We are indebted to board member Cheri Tarutani for assistance in supervising the MSW student inters. Erika Hill, Hawai‘i BYU graduate intern – worked for us about ¾ time for about 6 months in the spring 2018 – she was a great help with many projects. We also gave frequent assistance to students all over the US and world who contacted us by email primarily for information about public health approaches to criminal and social justice issues, restorative justice, access to publications, our work, help finding them internships, jobs, etc. 6. Public Service Announcement made for ‘Olelo: ED made a PSA at ‘Olelo’s request that we posted on our home page of website hawaiifriends.org. 7. HFRJ became a member of the Hawai’i Legal Service Provider Consortium: HRFJ became an member of the legal service providers consortium recognized under Supreme Court Rule 21(c)(3)(iii) that requires current members of the consortium to vote on adding new members which HFRJ was voted into in 2018 (http://www.hawaiijustice.org/hawaii-access-to-justice-commission/about-the-commission/rule-21). 8. Other services: Collaborated with Hawai‘i Woman’s Fund and the Aloha Medical Mission to obtain a full set of dentures for a woman incarcerated at WCCC. She was on furlough when the dentures were made for her and unfortunately she became re-incarcerated, but we were able to get her the dentures despite her imprisonment. Board member Leela Bilmes Goldstein was vital help for this project and we hope to help other women coming out of WCCC obtain dentures as necessary. We continued serving many disenfranchised individuals and collaborated with the justice system to improve the justice system. 1. Provide pilot project of a whole school RJ and solution-focused program – work with Kalihi public schools to understand their needs and how best to apply and measure outcomes of RJ philosophy and practices. 2. Research the cost and benefits of the reentry circles – Dr. Janet Davidson’s evaluation shows the circles reduce recidivism. Now we need to research the costs and benefits, and how much the circles might save the state compared to incarceration. Dr. James Richardson from UH Shidler School of Business, who has degrees from MIT and Wharton, has volunteered to do the research and has begun the cost benefit evaluation. 3. Assist others replicating the reentry circles – we are in contact with the people in Alaska, France, Hungary and Brazil and regularly communicate with the Europeans and Americans about the reentry circle model by providing meetings over the phone and in person when possible. We also hope to help an NGO in Nepal working in RJ to learn more about RJ and the reentry planning process to provide it or a variation of the process there. 4. Continue assisting students to learn about RJ – including hosting a student intern from New Zealand for one month on our work and mentor her throughout the year on applications of our models as she may apply them. 5. Provide 11th Parole Completion Celebration with Hawai‘i state Parole Office supporting several awards at the event. 6. 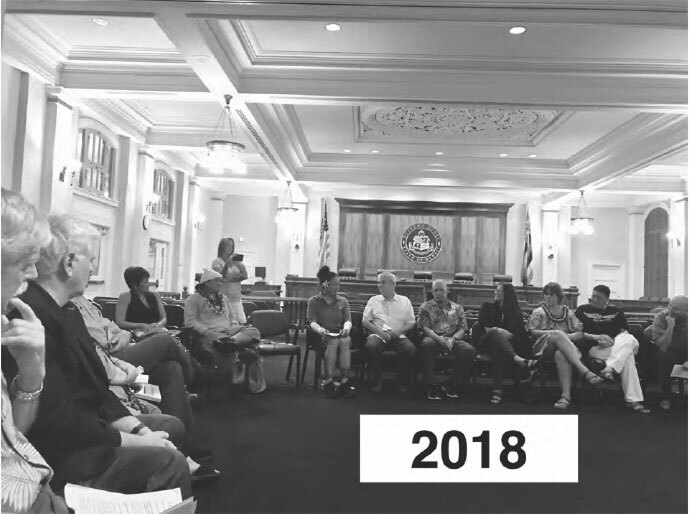 Provide at least two community talking circles and/or conflict management workshops in collaboration with judiciary’s Center for Alternative Dispute Resolution (compassionate listening workshop scheduled at Ali‘iolani Hale on January 23, 2019). 7. Collaborate with other O’ahu peacemakers – train more facilitators and individuals to work with schools. • Write a paper on the reentry circles shuttled information and any cultural similarities with satisfaction (what people who cannot attend the circles due to their location, work, etc., but who contribute their thoughts and feelings by speaking with a facilitator who writes the information down and shares (by shuttle) the information during the circle. • With results of the cost and benefit evaluation that Jim Richardson, Ph.D., does we will write a paper and submit for publication by the end of 2019 reporting the outcomes. . Overall income $87,480. This sum includes a grant for $78,000 for the Pros & Ex-Cons peer education project (that was named by the formerly imprisoned person who founded it) to promote and support higher education for incarcerated and formerly imprisoned women. We are only the fiscal intermediary for the program and are only assisting the woman who developed it and is managing it). Our organizational expenses to provide services were $37,140.98. These include the costs for 78 inspiring books, e.g., Wild, by Cheryl Strayed, Sing for Your Life, by Ryan Speedo Green, Man’s Search for Meaning by Viktor Frankl, I Know Why The Caged Bird Sings, by Maya Angelou, Educated by Tara Westover, Becoming by Michelle Obama, Manchild in the Promised Land by Claude Brown, Picking Cotton, by Jennifer Thompson-Cannino, Ronald Cotton and Erin Tornro, and Forgive For Good, by Fred Luskin. We also provided the women in our WCCC courses with writing paper, stamped envelopes, and pens. Additionally we supplied pens and paper to the 5th grade Kalihi class we worked with. We also bought and give several books to imprisoned individuals and to people who work in the justice system. Our overhead which is normally less than $6000 annually was $13,510.13 in 2018 due to insurance increases and website work for launching the legal guidebook. Despite the increases, most of our income (not counting the Pros & Ex-Cons peer education program that we are acting as a fiscal intermediary for) was used to support services and provide materials for program participants.